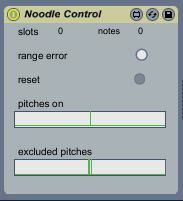 Noodle Control is a device for collecting MIDI information from Live clips containing Noodle Send modules and calculating the total number of active voices and the pitches of the notes currently playing. It then feeds this information back to other nwdlbots. It also uses an Avoid Filter which calculates a set of “excluded pitches” that are fed back to ScaleBots. The ScaleBots can then reject these pitches in their calculations to avoid dissonance. Only one Noodle Control device is required per Live Set using nwdlbots. This version of noodle control will handle nwdlbot information from Live slots 0 -31. If data arrives from slots outside this range the indicator will flash. Press to reset Noodle Control. This occurs automatically at timepoint 0. A graphical display of notes on now. A graphical display of notes currently excluded by the Avoid Filter.